Gender discrimination is prejudice or discrimination based on a person’s gender in circumstances where the gender difference is irrelevant to a person’s rights, abilities or performance. Though it may affect any gender, women and girls are the most commonly affected. 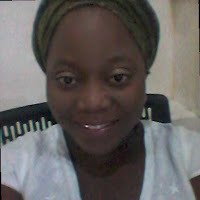 The right to freedom from discrimination on the basis of gender, race, ethnicity, etc, is protected by Section 42 of the Nigerian Constitution as well as by many international instruments, which Nigeria has ratified and enacted into law. However, some of the laws enacted in Nigeria, contain provisions which to encourage and perpetuate discrimination against the female gender. The discriminatory provisions in the Police Act and Regulations Cap P19, L.F.N, 2004 (the Act), shall be the focus of this discourse. The discriminatory provisions are mainly contained in Regulations 118 – 126 of the said Act. Those Regulations deal primarily, with the enlistment and duties of female police officers. 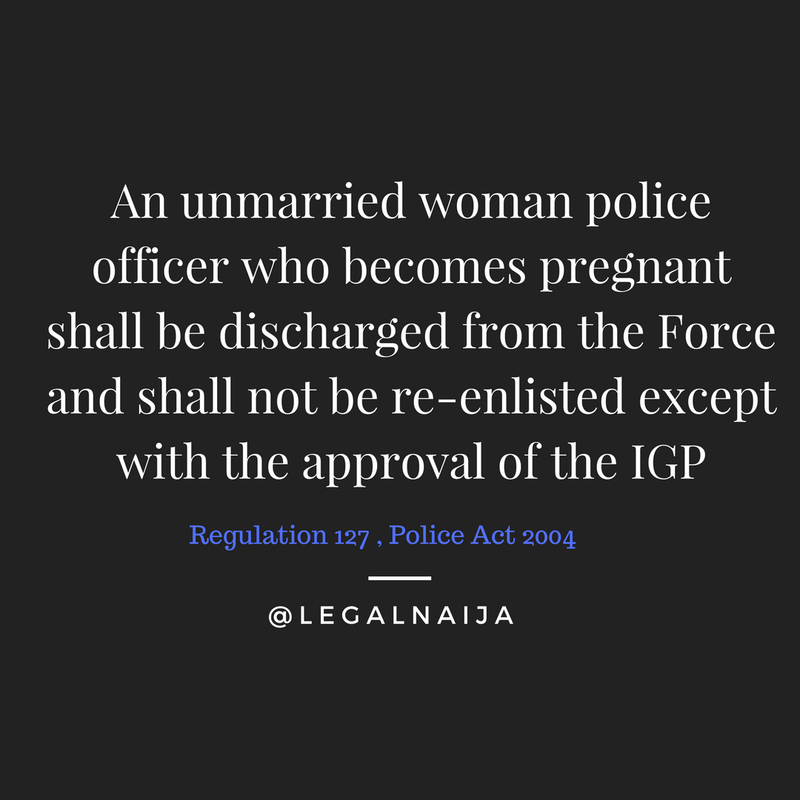 Regulation 118 of the Act, provides for the criteria to be met by a female, seeking enlistment into the Nigerian Police Force (hereafter referred to as NPF). By paragraph (g) thereof, such a woman must be UNMARRIED. (f) crowd control, where women and children are present in any numbers. These duties are far too mundane for any police officer and seem to suggest that the female police officer is incapable of carrying out the more technical aspects of police work. It is interesting to note that by Regulation 124 of the Act, a female police officer needs to apply in writing, for PERMISSION to marry, from the Commissioner of Police, of the state police command, where she is serving. The written application must state the name, address, and occupation of the person she intends to marry. That section further provides that permission will be granted for the marriage if the intended husband is of good character and the WOMAN POLICE OFFICER HAS SERVED IN THE FORCE, FOR A PERIOD OF NOT LESS THAN THREE YEARS. The latter part of that section implies that a female police officer in Nigeria, will not be allowed to marry, any time less than 3 years after joining the NPF. This is besides the rather appalling fact that she must apply for and obtain permission before she can be allowed to marry. 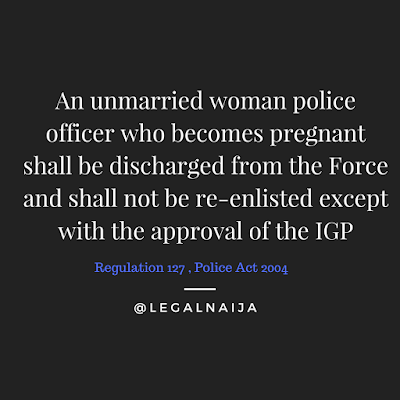 By Regulation 127 of the Act, an unmarried woman police officer who becomes pregnant shall be discharged from the Force and shall not be re-enlisted except with the approval of the Inspector-General of the NPF. It is interesting that these are only applicable to women, in the Nigeria Police Force. A comparison of these provisions with those contained in Section 72 (2) of the Act (the subsection dealing with the enlistment of male police officers, into the NPF), will show no such restrictions exists with respect to male police officers. What if a male police officer impregnates a girl, out of wedlock? What is the point of placing such ridiculous conditions on women? Why are the male and female officer subject to different rules? It suffices to say, that the provisions of Section 42(3) of the Constitution, deals with the appointment, while the aforementioned discriminatory provisions of the Act, extends to serving female police officers. l. Every individual shall be equal before the law. It is interesting to note that these offending provisions in the Police Regulations which were enacted in 1968, at a time when the societal attitude to women in the workplace was very different from what it is today, still remain on our statute books. This is more so as there is no rational justification for the imposition of these discriminatory provisions, since they do not in any manner promote the efficiency or discipline of the female police officer and today, women occupy very senior roles in the Police and have shown themselves to be just as competent and as disciplined as their male counterparts. An example is the rise of Farida Waziri, through various notable ranks in the NFP, up till Assistant Inspector General of the NFP. The move to expunge these regulations is thus, long overdue. Relying on the provisions of the African Charter, and the principles of equity, good conscience, a move can be made for the discriminatory provisions of the Police Act and Regulations, to be expunged. 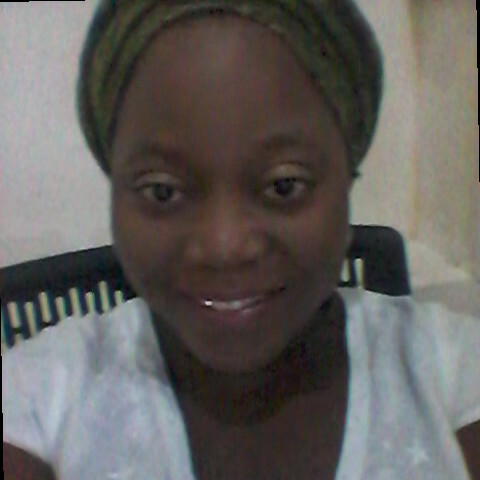 It is my hope that the needful is done, in the nearest future.